A few weeks back I finally had the chance to visit the ‘High Country’, an area in North Victoria that’s developed a reputation as a craft beer hub. I’ve been meaning to visit for quite a while, mainly because of my love for Bridge Road Brewers, who have been responsible for some of the more interesting and creative beers in Australia in recent years. 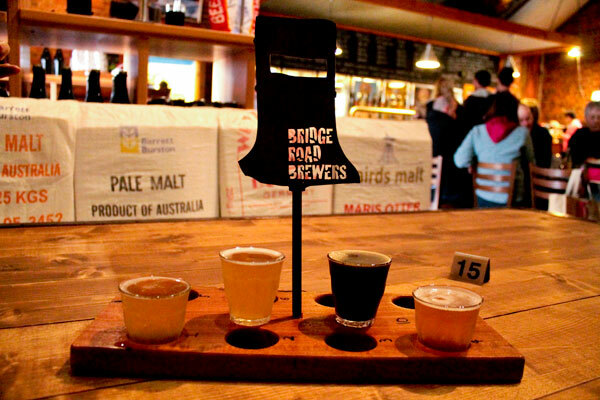 Bridge Road’s brewery is situated in the quaint historic town of Beechworth. Set in a lovely old brick building, the brewery has some good grub, a buzzing atmosphere and, most importantly, plenty of good beer taps. Bridge Road has always excelled with collaborations, seasonals, and one-off beers, and I decided to get tasters of a few of their latest. First was the collaboration with the South Australian pub The Wheaty, Wheaty Weiss Ohne Schuss, a Berliner Weisse with subtle acidity that ranked high on drinkability. Next was the latest Hop Harvest Ale, featuring this year’s batch of wet hops and fresh on tap it exploded with herbally hops flavours. Best of all, was Aurora Borealis, which technically is actually a Nogne O beer, brewed in Norway and shipped to Australia in whiskey barrels. Coming in at over 14% this is not a beer to be trifled with and had an amazingly complex taste. I often find strong beers, overly sweet, but the peaty whiskey flavours balanced out the sweetness nicely, while still allowing the lovely dark fruit flavours to come through too. All in all, a taste experience to be remembered. I also departed Beechworth with a six-pack of Dark Harvest, Bridge Road’s brilliant collaboration with that infamous gypsy brewer, Mikkeller. A Black IPA with wet hops, its flavour combination is best described as choc-orange and let it be know that this is one seriously flavoursome yet smooth beer. The other brewery in the High Country I had the chance to check out was the Bright Brewery. It’s a nice spot for a beer, backing out onto a picturesque park and river. I began there with the Pinky Framboisie, a raspberry lambic that is tart and refreshing,and followed up with a Staircase Porter, a dry porter with a good dose of chocolate aroma. The High Country has been receiving some well deserved attention in the craft beer community of late. If you’re interested in making the trip yourself, here’s the High Country brewery trail guide. If you’re Melbourne-bound you can still drink the beers this week at the High Country Tap Makeover at the Local Taphouse, which includes the launch of a High Country collaboration beer between the Black Dog, Bridge Road, Bright, and Sweetwater breweries. Here’s a couple of other blogs that chronicled their High Country adventures too if you’re interested.